Caricatures at wedding receptions are super fun! I can sports composites of teams. Heads or heads and bodies with numbers, team logos, etc. Are your players tired of trophies?? Give them caricatures instead. Email me photos. I can reference ANY sport via the internets. Here I am sketching Mr Forrest Lucas! Quality keepsakes for your guests. I also work from photos and generate work "on the drawing board" and ship to you! I teach as well, and have had a background check so you are comfortable with my services at your event with children. 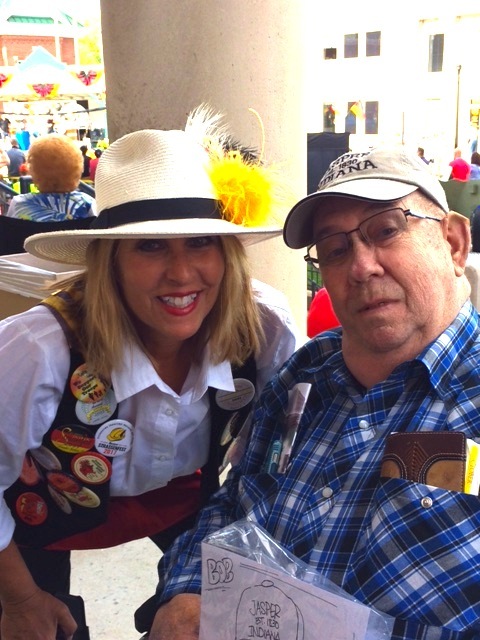 Know Who You Hire for events-- and have fun! 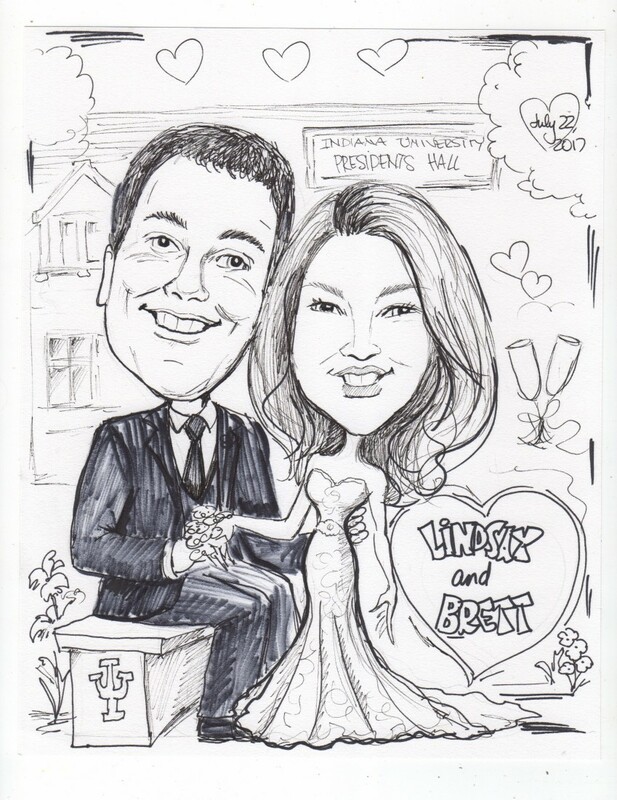 My husband and I went to a wedding where a caricature artist did on the spot drawings for guest and loved the idea. We met Karen at the Bloomington Bridal Convention and contacted her right away to book her for our wedding. She did an excellent job capturing the likeness of our guests. She was also professional and quick to respond to emails. She contacted me a month or so before the wedding to confirm details and arrived promptly at our venue. Her pricing is very reasonable and a great value for the quality of drawings! She even did a caricature of my husband and I from photos that I emailed her so we wouldn't have to spend time away from greeting our guests. I would highly recommend her for your event. Karen came for 3 hours and did both face painting and caricatures for our anniversary/birthday party. There were both young and old there and everyone enjoyed her. She was so pleasant to work with and her art is fabulous. I highly recommend Karen! 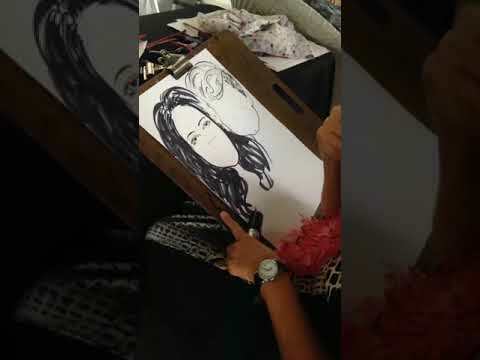 We hired Karen to do caricature drawings at our wedding reception. The guests absolutely loved it and said the drawing were the best wedding gift they have ever received! Thanks Karen! Heard great things about Karen, but she impressed me even more on the day! She sketched every single person at our wedding, even moving venues with us, and she kept a huge smile on her face the entire day. Such a sweet, talented woman! I draw quick sketch caricatures on the spot for your event, party, bar/bat mitzvah, wedding reception, college event, etc. Prices start at $80 per hour. I provide bags and my own supplies, table, etc. Each drawing is three to five minutes per sketch in black white. Color takes a bit longer. I also can do finished work from photos you provide, full color or black and white, with many details. Call for a quote. These are great gifts for brides and grooms, retirement honorees, etc. Please refer to my website for examples. I sketch classy caricatures at parties, events, trade shows, bar and bat mitzvahs, festivals, nursing homes, school functions, sports events, grand openings, etc. Please contact me for availability for your special event. Fun! Fast! Famous sketches: Willie Nelson, Helio Castroneuves, Al Unser, Sr., Al Unser. Jr., George Bush, etc. Check out my website and request my CV. 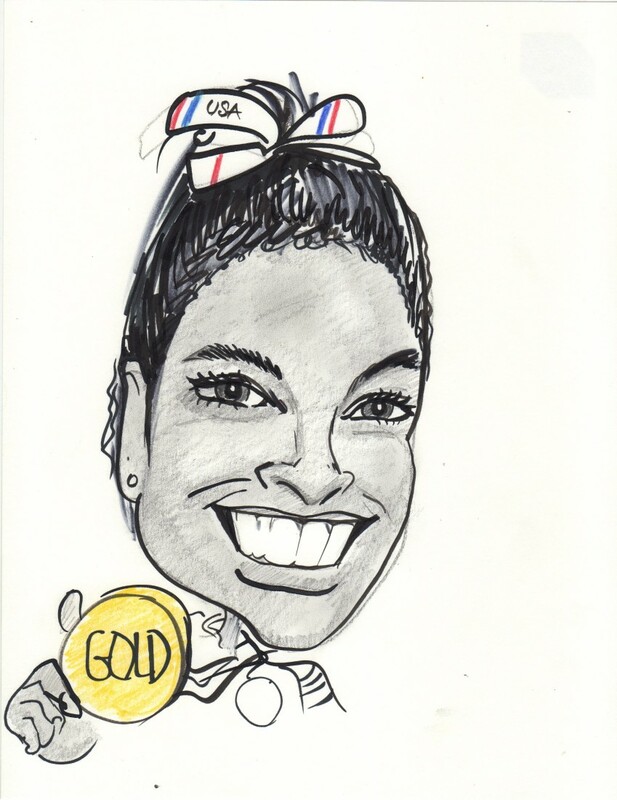 Black and white caricatures are great "take home" gifts for events. I can draw individuals, couples, or groups. I work on a heavy card stock paper and sleeve each sketch in plastic. They are durable and travel well. I sketch heads only in 3 minutes: heads and bodies with a theme take 5 minutes per person. Email or ask me about themed pre printed backgrounds. Full color is a nice option and takes a little longer for each sketch. On site color caricatures are about 12 minutes per person. Please look at my website www.karenkovich.com, and check out detailed full color work: these make great gifts for graduates, retirees, families, sports teams and may be reproduced. The artwork becomes yours upon purchase. Art is entertaining: people enjoy watching the art work evolve! Children are interested in watching the creative process of the work and I enjoy answering their questions. Many clients book back again and again because the "art thing works well". My caricatures are fun and never offensive. Let me know about your lighting: I can provide. 5' x 5' space works well or I can travel with my drawing board and markers.